The PARTZSCH group of companies with its comprehensive range of products and services all around the electric machine, is for partners and customers far beyond the borders of Europe, warrantor of their reliable high quality production and repair. On 40,000 sqm production area, equipped with the latest technology, a complete service for electric, rotating machines of 100 kW to 250,000 kVA and weights up to 120 t is offered. From components to complete drive - all from one source! As medium-sized company, we specialize in repair, maintenance and new production of electrical machinery. Equally whether it is an AC or DC machine. From the on-site service, repair up to rewinding, production of laminated cores or even the reproduction of machines, all services in the field of rotating, electric machines. machines as an important business field, service companies and end users alike can enjoy the high quality standard the company has been famous for since its foundation in case of maintenance and repairs. With the current expansion process of the PARTZSCH Group, the owner-managed PARTZSCH Elektromotoren e. K. will meet future economic developments. About 400 employees are currently working for PARTZSCH Elektromotoren e. K.
In the 1990s, the delivery times for winding wires for service jobs were extremely long. As a result of this bottleneck, a group of employees and an engineer with a high level of expertise developed their own wire production. From this bold idea a company was born, which now currently employs 53 people and produces some 6,000 tons of winding wire annually. The production range includes the manufacture of rolled and/or drawn profi le and round wires. The product spectrum now includes up to 50 different types of wire, from enamelled to wound and braided wires, all available in a whole range of dimensions. Up to 50% of these wires are used within the PARTZSCH Group. The other 50% are produced for customers throughout Europe. 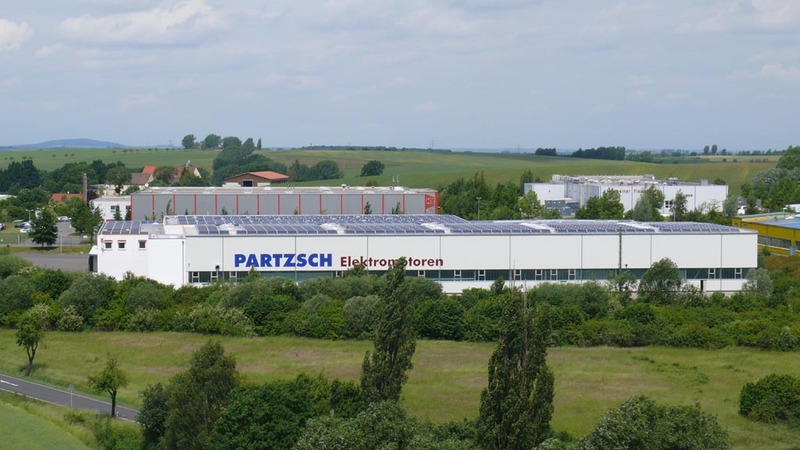 As the latest business segment of the PARTZSCH group, the PARTZSCH Elektromaschinenbau GmbH is concentrating on development, construction, calculation and distribution of electrical machines since February 2012. With specialisation in production on winding components of electrical motors and on generators up to 8 MW, PARTZSCH Elektromaschinenbau GmbH is one of the most innovative medium-sized company of the electrical industry. The field of mechanical processing is also covered by the complete range of CNC production up to the complex welding construction. Professional project handling is also guaranteed for the subjects like service, maintenance and repair of electrical machinery. Moreover, individual components are manufactured at the highest technical level and with quality and precision "Made in Germany", from the heart of Saxony. By taking over the Mechanik Leisnig GmbH with it’s over 100 years of manufacturing experience, the company continues to develop into a global full-service provider of electrical machines and power units. With the expanded product portfolio, in combination with current product developments, options will open up, which are of an incomparable benefit for our customers. This company of the PARTZSCH Group located in Bitterfeld, Germany, is an economically independent enterprise, acting independently in the market. The main fields of activity comprise the repair and production of components for DC machines, including on-site disassembly and assembly of motors and generators up to 250 MVA. The company, originally a repair shop for railway traction motors, is optimally positioned with its experienced technical staff and the latest manufacturing technology. Large assembly shops facilitate the production and repair of tram motors not exceeding 500 kg and rolling-mill motors not exceeding 120 tons in any performance range. The spectrum also includes rotors, main and commutating poles as well as compensating windings for DC machines of all kinds. Reacting to the continual increase of new wind turbines already installed or being installed in Germany, Thomas Partzsch, together with Holger Klotsche, founded the „Windgeneratoren & Service GmbH“. The company maintains generators in wind turbines with gear systems. The offi ces and contacts for customers and services teams are also located in Döbeln-Ost, Germany, near the PARTZSCH Group headquarters. With a fleet of mobile workshops, we offer our expert service for wind turbines both in German and abroad. GENET is a new engineering and sales company based in Ingolstadt, Germany. The team consists of experts with longtime and international experience in the development and manufacturing of synchronous generators for power generation. With its comprehensive vertical integration and state-of-the-art machinery PARTZSCH offers ideal conditions and realises the entire manufacturing of the machines within this cooperation.